SilkStart allows you to embed Google Maps into any custom page as an iFrame. Search for your location to embed. Click "Share" from the menu on the left. From the box that pops up, select "Embed Map". 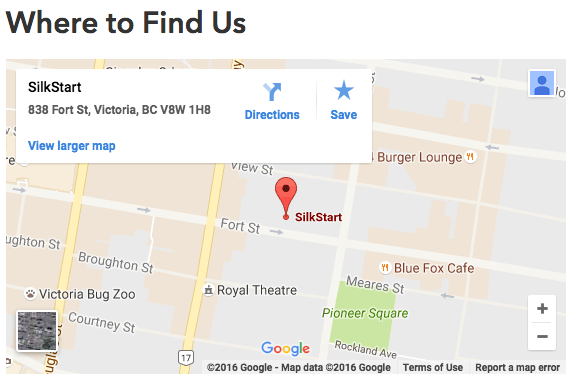 On your SilkStart site, find the page you would like to add the map to, and open the page in editing mode. Click into the section where you want the map to go. From the text editing options, click on the "Source" button, which appears in the top left corner of the editor. Paste the Google Map embed code into the source of your page, and click 'Okay'. 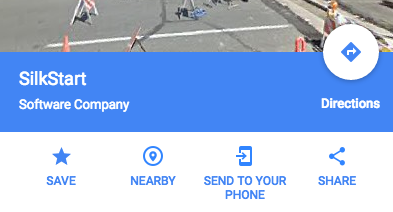 Your map won't load right away - you'll see a placeholder box with the word 'IFRAME' instead. Save your page, and leave editing mode. Your map should now load on the page (see below for an example). To edit your iFrame, enter page editing mode and double-click on the iFrame placeholder. This will show your iFrame editing options so you may adjust the size etc. How do I add a YouTube video to my SilkStart site? How do I format text in SilkStart?